Can we all agree, Republican senators who have voiced opposition to the new Senate health care plan, sound like they just want something in exchange for their votes? Can we all agree, Senator McConnell’s plan has nothing to do with what might be best for Americans but everything to do with politics? Can we all agree taking money from poor people, who don’t vote, and giving it to rich people who do, is not what we should be doing? 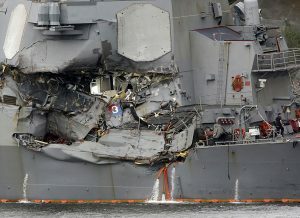 Can we all agree, it’s unbelievable that a week after the collision of a Navy destroyer and a cargo ship cost the lives of 7 sailors, we still have no rational explanation of why it happened? Can we all agree, the Obama administration’s handling of the Russian attacks on our electoral system, shows that the former President’s trademark caution was a liability? Can we all agree, by prohibiting video or audio recordings of the daily press briefings the administration has managed to create the impression they are actually running a functioning government? Nice try. Can we all agree, if California adds many more jurisdictions to the list of states whose policies we don’t like, Golden State public servants may not be attending any out-of-state conventions? Can we all agree, most other administrations would object to calls from foreign governments trying to close down a news outlet, but Mr. Trump’s silence is pretty deafening? Can we all agree, Mr. Trump has once again revealed himself as nothing more than a schoolyard bully when he claimed to have tapes of his meetings with former FBI Director James Comey? Can we all agree, threats to fire Special Counsel Robert Mueller fall in the same category? Can we all agree, as long as the drip, drip, drip of Russia related headlines continues, Mr. Trump will not be able to move ahead with the rest of his political agenda? Can we all agree, the American public deserves to know which state election systems were attacked by Russian hackers? Can we all agree, Attorney General Jeff Session’s decision to hire a private attorney, doesn’t help? Can we all agree, now that grizzly bears outside of national parks, are being delisted as endangered species, it won’t be long before one of the Trump sons makes headlines for shooting one? Can we all agree, Democrats, who failed to capitalize on Anti-Trump sentiment in a Georgia election this week, have a lot of work to do if they want to take back the House in 2018? Can we all agree, their first step might be to get minority leader Nancy Pelosi to step down? Can we all agree, it’s hard to know what a ‘shake up’ in a totalitarian government, such as Saudi Arabia, really means? Can we all agree, The Environmental Protection Agency, is no longer an agency that we can count on to protect the environment? Can we all agree, Energy Secretary Rick Perry, proves every day that he is unqualified for the job he holds? Can we all agree, the qualifications of the latest round of nominees for federal posts are simply embarrassing? And it doesn’t look like the talent pool will get any deeper, just ask the folks in New York where a wedding planner now heads the housing office. Can we all agree, we are heading for large scale wars in Syria and Afghanistan? Can we all agree, Mr. Trump’s housing policy, which seems to involve cutbacks in everything except programs that benefit him, is pretty transparent? Can we all agree, the Supreme Court’s decision to hear a case on political gerrymandering of congressional districts, may have more significance than anything Congress does in the next year? Can we all agree, offensive trademarks may be protected as free speech, but they have no place in a civilized society? Can we all agree, the award for the most awkward moment of the week has to go to Marco Rubio and Ivanka Trump? Can we all agree, the high school principal who tried to shut down a critical speech by the class valedictorian, probably wishes he hadn’t? Can we all agree, the forced resignation of Uber CEO Travis Kalanick should be a lesson for every new CEO trying too disrupt the status quo – there are still rules? Can we all agree, we can hope that Mr. Trump will run out of friendly places to campaign, but Johnny Depp’s suggestion that the President should be assassinated, just invigorates Mr. Trump’s base? American food icon Alice Waters on what the Whole Foods purchase by Amazon could mean for the US food supply. Can we all agree, we should all applaud the administration’s decision to allow the so-called ‘dreamers’ to stay in the United States without fear of deportation? Unfortunately their parents will still live in fear. Can we all agree, Amazon’s purchase of Whole Foods has nothing to do with organic food but everything to do with competing with Walmart? Can we all agree, Senator Mitch McConnell obviously learned a lot from House Speaker Paul Ryan, who was able to get a healthcare bill passed by keeping it secret until the last minute? Can we all agree, the investigation by special counsel Robert Mueller got a lot more serious this week with the news that Mr. Trump may face charges that he impeded a federal investigation in firing FBI director James Comey? Can we all agree, Mr. Trump continues to make his own situation worse with his tweets and rants? Can we all agree, Mr. Trump is governing ‘like the leader of 35% of the country‘? 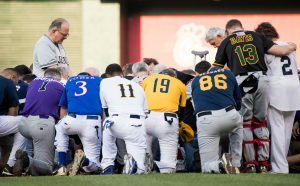 Can we all agree, it would be nice to think the shooting of a Congressman, practicing for a charity baseball game could bring the political parties together for more than one day, but it’s doubtful given the rhetoric? Can we all agree, news that Fox News is dropping its trademark “fair and balanced” slogan, has allowed everyone to admit that it was really just a marketing tool and never true? Can we all agree, the only person who thinks Mr. Trump’s most recent financial statement clarifies anything, is Mr. Trump? Can we all agree, news that Mr. Trump’s attorney and the Vice President have both hired attorneys could set off hiring frenzy by White House staffers who know Mr. Trump’s lawyer is not defending them? Can we all agree, Trump supporters would probably not have objected to the revival of Shakespeare’ s Julius Caesar if the lead character was a woman in pant suit? Can we all agree, the tragic fire in London may be a bigger test for Prime minister Theresa May, than either of the two recent terrorist attacks? Can we all agree, those of us who are not sailors have a hard time figuring out how two ships can collide 12 miles from shore? Can we all agree, Mr. Trump conveniently forgot to tell his adoring supporters in Miami that the rollback of travel to Cuba could take three years? Can we all agree, the acquittal of a Minnesota police officer in the shooting death of a motorist suggests that there will always be some doubt about what really happens when African-American motorists are stopped by police? Can we all agree, lottery players in Illinois may be the group that forces a state budget compromise when they find out they can no longer buy Powerball and Megamillion tickets? Can we all agree, the City of Los Angeles deserved to lose a huge gamble this week, when a sanitation worker won a $17.4 million lawsuit against his supervisors who harassed him into disability by falsely claiming he was gay? Can we all agree, it’s pretty clear there are very few world leaders who have much respect for Mr. Trump? Can we all agree, it’s pretty clear the lawsuits brought against 12 Turkish body guards accused of assault, when they attacked protesters in New York, is pretty meaningless, since the men are out of the country and probably are not planning a return trip? Can we all agree, the Senate surprised everyone this week by voting to impose more sanctions on Iran and Russia and restricting the President’s power to make changes? Can we all agree, Kamala Harris’ standing as a Democratic star of the future was cemented this week by her prosecutorial performance against Attorney General Jeff Sessions? Can we all agree, Australia finally made the right move by paying $53 million dollars and closing their prison-like facilities holding refugees awaiting approval to enter the country? Can we all agree, the Democrat’s lawsuit against Mr. Trump didn’t get much press coverage, given the other events of the week, but it could be the key to the eventual release of Mr. Trump’s tax returns? Can we all agree, despite the Republican’s best effort to lob softball questions, AG Jeff Session’s showed that he is unqualified to be the top law enforcement official in the country? Can we all agree, it’s tragic that a now brain-damaged American has become a pawn in the egomaniacal three way chess match between former basketball player Dennis Rodman and the leaders of North Korea and the the United States? Can we all agree, this week’s first full cabinet meeting was a sickening display of orchestrated ego-stroking? Ann Killions column on Warrior coach Steve Kerr’s reaction to his team’s NBA championship. The Washington Post’s Fact Checking video on all Mr. Trump’s flip flops since the day, exactly two years ago, when he came down the escalator at Trump Tower to declare his candidacy. Can we all agree, if Donald Trump testifies under oath, perjury charges and then impeachment are sure to follow? Can we all agree, maybe Mr. Trump is right about Mr. Comey – if there’s one thing Mr. Trump knows, it’s how to lie? Just two guys, Barack and Justin, having a night out in Montreal. Can we all agree the talk about obstruction of justice is irrelevant in the impeachment debate, because impeachment has nothing to do with legality, it’s all political? Can we all agree, the Senate and Mitch McConnell, take a back seat to no one in the chutzpah department, by passing healthcare reform, while most of the nation was watching James Comey testify? Can we all agree, Theresa May’s loss in the British election really makes you wonder if this was the real point to the ISIS attacks in London and Manchester? Can we all agree Montana should be very proud that they will soon have a politician with an assault conviction representing them in Congress? Can we all agree we should learn a lesson from the Mayor of London who simply ignored Mr. Trump’s ridiculous tweets? Can we all agree the best story of the week is the dinner between President Obama and Canadian Premier Justin Trudeau – just two guys having a night out? Can we all agree the funniest story of the week was the North Koreans blasting Mr. Trump as an egomaniac? Can we all agree, the more South Korea tries to placate their neighbor to the north the more bellicose North Korea becomes? Can we all agree when the President says one thing and the Secretary of State says another, one of them will be ignored, and it probably won’t be the President? Can we all agree the EPA administrator needs to check his facts on coal jobs created over the last few months? Can we all agree the House of Representatives should really stop wasting it’s time on legislation that has no chance of passage in the Senate? Can we all agree as the administration’s poll numbers continue to deteriorate, it should be only a matter of time before the GOP abandons the Trump ship of state? But it doesn’t look that way. Can we all agree, Mr. Trump’s infrastructure plan, announced this week, is little more than a reward for contractors who supported him? Can we all agree, most Americans doubt that Mr. Trump is really the right person to undo the political crises with Qatar that he may have created? Can we all agree, after this week’s exchange between Mr. Comey and Mr. Trump, it’s hard to imagine that anyone would want to lead the FBI? Can we all agree most Americans had little reaction to the ISIS attack on Iran, because they, unfortunately, agree with Mr. Trump’s tweet? Can we all agree The Chinese had it right this week when they welcomed California Governor Jerry Brown and ignored Energy Secretary Rick Perry? Can we all agree, at least Mr. Trump’s mention of Pittsburgh, PA, gave the city a chance to show the world how much it has changed since its days as a steel town? Can we all agree, Attorney General Jeff Sessions’s offer to resign, was almost a dream come true for progressives? Which is probably the reason the offer wasn’t accepted. Can we all agree Uber’s move to fire 20 employees over sexual harassment claims really makes you wonder why anyone would want to work there? Sort of like the White House. Can we all agree Harvard University’s move to revoke acceptance to students, over their social media activity, is an ominous warning to the millions of immature high schoolers who don’t realize the internet is forever? Can we all agree the Democratic race for President might make the GOP’s 20-candidate field in 2016 look very small? Can we all agree the arrest of a private contractor for leaking sensitive documents, could slow the leaks, as sources worry whether journalists will protect their identity? Can we all agree Republicans support for the administration’s plan to cut 30,000 employees by creating a private corporation, is surprising since it is essentially unraveling the policies of the GOP’s favorite leader, Ronald Reagan? Can we all agree there might be a glimmer of hope for the GOP, given what’s happening in Kansas? Can we all agree Megyn Kelly’s interview with Vladimir Putin, just gave him another forum to lie to the world? We should all take a break and head out to see Wonder Woman this weekend. Can we all agree Donald Trump abandoned the Paris Climate Change Agreement when he appointed Scott Pruitt to head the EPA? Can we all agree Vladimir Putin essentially admitted this week that Russians interfered in the US election? Can we all agree the French President had a great comeback to Donald Trump? The NY Daily News gets it right, again. Can we all agree, it’s clear Mr. Trump has no factual basis for his decision? 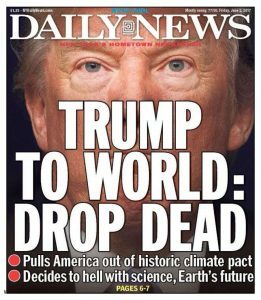 Can we all agree the countries, states and cities who know climate change is already here have just two words for Mr. Trump: Drop dead? Can we all agree, Mr. Trump doesn’t seem to realize his base, which seems happy with climate change, only makes up about 30% of the electorate? Can we all agree, it doesn’t really matter whether Mr. Trump believes in climate science? But it would be nice to know. Can we all agree, it’s pretty clear, Mr. Trump’s policies change depending on who he favors? This week it’s Steve Bannon, and not Jared Kushner. Can we all agree if Joe Biden, at 76, decides to run in 2020, Trump (or Pence) is toast? Can we all agree China is more than happy to see the United States make itself irrelevant and allow them to become the world leader in yet another category? Can we all agree we seem to have hit full employment but it does;’t mean much for all the coal miners who still can’t find work? Can we all agree it’s becoming clearer by the day that the Senate will not pass a healthcare bill any time soon? Can we all agree if the spouse of a current employee won’t work for you, you might be the toxic workplace? Can we all agree the GOP seems intent on hiding their own report on CIA torture? Can we all agree it’s already pretty clear why the White House didn’t want to release their ethics waivers: the forms are a mess? Can we all agree the term ‘ethics waivers’ seems pretty absurd for a White House with no ethics from day one? Can we all agree someone needs to tell Devin Nunes, head of the House Intelligence Committee, that no one cares about any subpoenas he issues, because he has no credibility left? Can we all agree the world may be distracted this week by climate change, and c0vfefe, but by next week, the probe of Russian interference in the US election will be back to center stage, despite Mr. Trump’s continuing claims that it’s all a hoax? Can we all agree there was some good news on the environment this week when a California court ruled the state could force Monsanto to label products as carcinogens and Exxon-Mobil stockholders forced the energy giant to report on the impact they are having on climate change? Can we all agree Ohio’s suit against the makers of opioids will have little impact unless others join in? Can we all agree Mr. Trump doesn’t seem to realize how bad it looks when he tries to curry favor with the Russians by returning two compounds that were seized as punishment just six months ago? Can we all agree if the government tries to roll back Mr. Obama’s Cuba policy he will be swimming against a very strong tide? Can we all agree it takes a pretty small person to steal the belongings of a dying man who tried to defend two women against the verbal abuse of a white supremicist? Can we all agree the government faces an uphill battle trying to convince the Supreme Court that they are likely to win their case for the Mr. Trump’s immigration ban? Can we all agree comedian Kathy Griffin gave Mr. Trump a huuuuuge present this week, by posing with a mask that appeared to be his severed head? Can we all agree Congress has done a great job of hiding that fact that they have made a mockery of internet privacy? Can we all agree the next financial showdown over the debt ceiling will get here sooner than most politicians expected or wanted? Can we all agree, say what you will about Texas legislators, they sure know how to embarrass themselves? Can we all agree French President Emmanuel Macron is quickly becoming a force to be reckoned with on the world stage? Just ask Mr. Putin. Can we all agree the only person who had a successful trip to the Middle East and Europe was Melania Trump? Yes, she of the $51,000 jacket. Can we all agree the military’s successful test of an anti-missile system does not make me, or anyone else in the Bay Area, feel any safer? RIP: Christian Deford’s dad, Frank, Shannon Allman’s husband, Gregg and Mika’s Brzezinski’s dad, Zbigniew ; giants in their fields.